On 1/31, armed with prosecco and homemade fudge (thanks, Lisa! 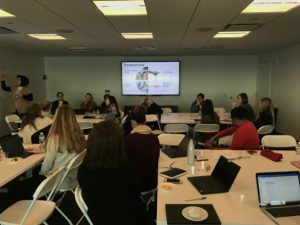 ), the Stamford WLN Chapter gathered with the purpose of finding out what our members would consider engaging content for the 2019 calendar year. It started back in December with a short survey that asked some basic questions: How often should we meet? How important is this organization to you? What type of programming would you like to see? We wanted to create a session that was inclusive to the thoughts and concerns of all of our members and used the survey as a starting point grounded in real metrics. With all of our data synthesized, we held a brainstorm session to discover which initiatives we should really focus on. Led by Anne Sullivan, Octagon SVP, we discussed programming in four key areas: professional advancement, social networking, work/home life balance, and more about our industry. Breaking into small groups, women were encouraged to create a list of potential programs that could fall under one of these categories (or not!). The second half of our meeting was reserved for a general discussion and presentation of concepts. Ideas ranged from IPG networking sessions to creating an internal award process, to “ask me anything” panels with senior leadership. We came away from our meeting invigorated with content that we hope will resonate throughout the year. Our next step will be to engage women across our chapter to lead specific initiatives, with the ultimate goal of presenting fresh perspectives and raising new voices. Interested in collaborating on 2019 programming? Reach out to Lisa Dixon or Kierra Holroyd for more information!